Developers, if you gather information about your install base for your apps you've likely run across Metrix, a project between Syntactix, one of our favorite developers, and webOSroundup. Following the announcement by webOSroundup earlier this month that they were going to be signing off for the last time, the decision to send Metrix offline was announced on Wednesday. 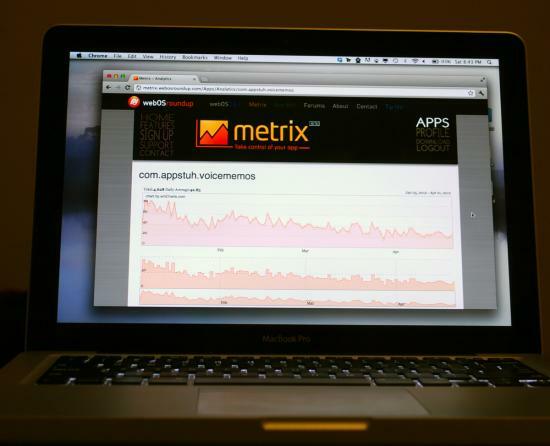 The servers used to host Metrix cost around $250 per month, a high cost for a service provided free-of-charge to developers. Metrix is one of the most widely-used analytics tool by webOS app developers and for good reason - implementing the tool with your app is a breeze and you can be up and running in a matter of minutes. Syntactix also made the decision to open source the entire Metrix codebase - meaning the Mojo and Enyo libraries to interact with the Metrix servers, as well as the Metrix server-side code. As such, any developer with the desire to continue gathering analytics on their apps can do so with relative ease, so long as you have the means to use the code, which requires a Windows server among other things. For developers looking to keep a historical record of their apps, you've got limited time to act and it requires that you contact Syntactix. They can provide you with a CSV file containing all of your Metrix data. Do keep in mind that there is no way to import this data into Metrix with ease so that will all fall on you to either manually enter the data into your Metrix server or to build an import function; if you choose the latter it would be beneficial to contribute it back to the developer community. Metrix has had a good ride and we've learned a lot over the years from Metrix data, such as when Palm was testing the Pre2 with Zhephree's foursquare app. We are saddened to see Metrix go though we can certainly understand why it must and we're grateful for the decision to open source the tool.